The Getzelmann Fund was established in 2014 to as a means to channel funds raised by The Bridge Community Church’s annual Getzelmania 5k run. The Getzelmania Fund is served by a board of five members who meet annually to determine what organization(s) will be the recipients of the proceeds of the annual Getzelmania 5k. The mission of the Getzelmann Fund is to prayerfully consider and award financial grants to organizations serving causes that would reflect Stephen Getzelmann’s wishes and/or organizations that serve widows and orphans. *Beth Getzelmann will serve as the first at-large member as long as she is willing and able to do so. Each year the board will vote at their annual meeting to determine who will make up the board for the next calendar year. The Getzelmania 5K is an annual fund-raising fun run, sponsored by The Bridge Community Church of Morrisville, NC in memory of Stephen Getzelmann. Stephen died suddenly from a Strep-A infection in December of 2011. The Getz 5k is The Bridge’s way of remembering Stephen and serving our community through his memory. 2012 - The first Getzelmania 5k took place on May 2012 in Stephen’s neighborhood of Breckenridge in Morrisville, NC. The race began near the community clubhouse with runners reaching the Getzelmann home and then returning back to the clubhouse to complete the race. The race included over 150 registered participants as well as dozens of children who participated in the Kids 100 yard dash. More than 400+ participants, volunteers and spectators enjoyed the event. Sponsors included Omega Sports, Georgina's, Carolina Vending, Principal Financial, Shamrock Painting, All-Star-Photos, Maestro Productions, and more. 2013 – The Bridge partnered with The Town of Morrisville and the event was moved to Town Hall Drive in Morrisville. The race grew to 225+ runners who participated with 600+ total in attendance. Kids R Kids preschool sponsored a 50-yard dash for kids 5 and under. The Cary YMCA Super Skippers jump rope team performed. Major sponsored included Omega Sports, PDQ, Kids R Kids Preschool, Smokey’s BBQ, and more. Stephen Payne Getzelmann was born in Mt Kisco, NY on his due date, August 4, 1968. I doubt he was ever on time after that. As a child, Stephen was easy going, laid back and really cute (I must add.) His whole life, he was a “people person.” Stephen loved his family and friends, and was the type of man who would do anything for someone who needed it or for someone he loved. Stephen brought people together---be it family, friends, parents, or even today, this wonderful church community---with his enthusiasm, creativity and joy of life. It was infectious. We miss him terribly. Stephen spent much of his youth on a dirt bike all over the hills of California, although he also spent a lot of time traveling. The first twelve years of his life, we moved every twenty four months, so Stephen got used to making new friends. He was not a natural athlete for baseball or soccer but he took up swimming at a very young age, and trained hard all through high school and college, at UNCW. Stephen was a team player, and was very close with his fellow teammates and coach. Stephen worked hard in school, and graduated from UNCW with a BA degree. After college, he landed a position with World Cup Soccer at Giants Stadium in New Jersey and Soldier Field in Chicago. He loved the job, although learning to deal with Labor Unions in New York and New Jersey toughened him up more than he expected. So did his next job, for Woolworth in Winston Salem, where he spent a great deal of his time chasing thieves out of his store. Stephen ran the store for several years, and it was one of the top performing Woolworths in North Carolina. Though his job transferred him to DC, Atlanta and Dallas during his career, he finally realized he wanted to come home to North Carolina. There, Stephen loved being an assistant manager at Lowes Home Improvement Store for over six years. His favorite part of the job was working on creative projects with his customers. He also met and married his true love on September 27, 2003 in Chapel Hill, NC. Stephen found another family through Bridge Community church. He helped set up service on Sundays when he wasn’t at Lowes, and Beth works in the baby room and kitchen. Stephen got what we thought was the flu the day before Thanksgiving in 2011. When we took him to Rex Hospital, doctors discovered he had a very uncommon Strep A infection, contracted from an unknown source. The infection had turned into Toxic Shock Syndrome, and unfortunately was very advanced. While Stephen fought hard for his life for ten difficult days, with doctors working around the clock to try to save him, he lost the battle on December 5th, 2011. He was surrounded by his family and church family. We feel blessed to have Beth and Tyler in our lives today, as well as the many family and friends who knew Stephen. His spirit lives on in all of us. 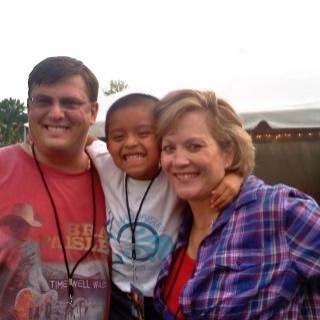 Beth and Stephen’s son is now eight, and, while he misses his dad very much, he is thriving in school and he loves to play soccer, Minecraft, Wii, outside with friends, and acting. ​We are grateful for everyone’s involvement in Getzelmannia, and for all the love and support people have shown us since Stephen’s death. This would have touched him very much. Thank you!